I was given this award quite a while ago by the lovely Netty - thank you so much! 1. Thank the person that gave this to you :) Go on, give them a virtual hug! It's so hard to think of nice things to say about myself! 1. I always try hard to make people laugh, no matter what the situation is. I think it's because I love being around happy people even if i'm not always happy myself. 3. I'm not scared of blood or needles. I've never been scared of blood and can watch all the hospital programs without feeling anything. I've never fainted and i'm really proud to be a blood donor. It annoys me that you can only give it once every 4 months as i'd love to give it more often. Whenever we had jabs at school I would end up getting scared because all my friends were but if I went on my own I would be fine. When I gave blood I was nervous as I thought it was quite a big thing to do but next time I donate i'll feel more confident. I took this last month and I know you've already seen it but I love it! Congrats on the award hun! I was given my first one the other day, I was so excited haha! I completely agree with you about making people laugh all the time, when people are upset I always try to make them laugh! 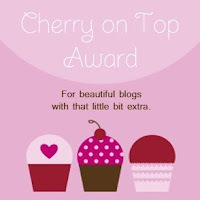 Love your blog, you definitely deserve the award! Thank you for your kind words, hun! Aww love the picture of your guinea pigs.